“Phoenix Terrace Recalling the Playing of a Flute “, the earlier lyrics of the melody is by Buzhi. 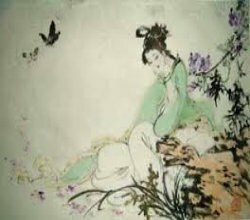 The famous lyrics are by the famous woman poet Li Qingzhao(1048-1151). This tune has drawn its materials from the Song Dynasty famous woman poet Li Qingzhao(李清照) lyrics.